Description: Beaded lace motifs dance over the bodice in this Donella Crepe fit-and-flare wedding gown. 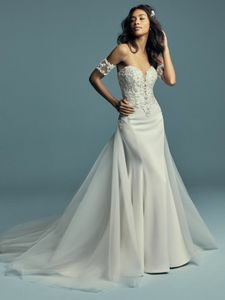 Unique crisscross illusion completes the plunging sweetheart neckline, also accented in beaded lace. Finished with zipper over inner elastic closure, with pearl buttons from back to hemline. Illusion lace armbands sold separately. Detachable tulle train accented in lace and Swarovski crystals sold separately.